I started occasionally freezer cooking in 2004 and feel in love with it in 2007. The first freezer cookbook I bought was The Freezer Cooking Manual from 30 Day Gourmet: A Month of Meals Made Easy. 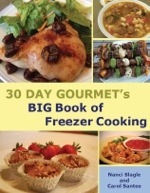 I was so excited when the 30 Day Gourmet’s BIG Book of Freezer cooking came out. It is a complete cooking method that teaches how to fill your freezers with nutritious and wonderful tasting foods. It’s the BEST freezer cookbooks I’ve come across for many reasons. There are 150 delicious recipes comes with nutritional information, photos of recipes, time saving worksheets, instructions, freezing information, online support and more. When you buy the cookbook you get access to 100’s more recipes online. Plus you can sign up for e-newsletter that includes more tips and recipes. 30 Day Gourmet, Inc. is #1 in my mind for all things freezer cooking and has been featured on television and in numerous newspapers and magazines. This cookbook is an absolute must buy! It is available in paperback or e-book form.